One of the previous articles that we have published here on https://balicabdriver.com, describes the Telaga Waja river as a location for adventure rafting. And it’s not the only one. 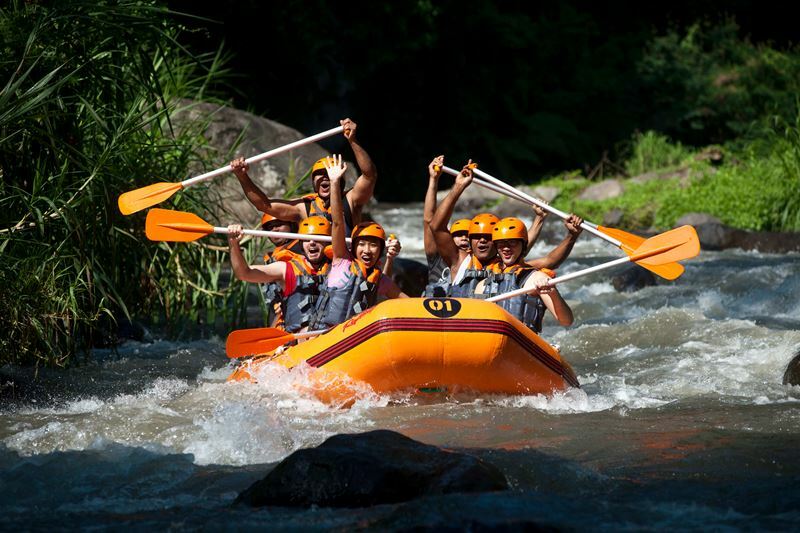 There is still another famous rafting adventure location in Bali, on the Ayung River, Ubud. 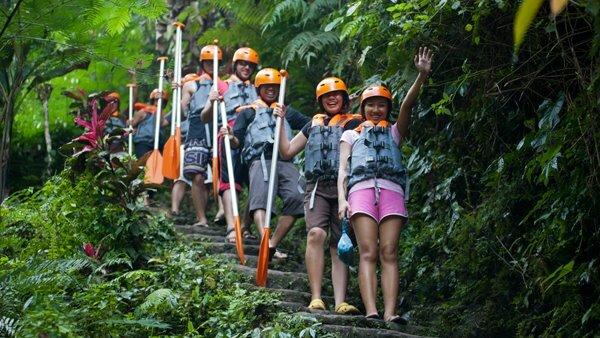 Ayung River Rafting is another outdoor adventure you can in beautiful Ubud, in the middle of famous Monkey Forest. Ayung Rafting is often offered by tour operators and hotels around Ubud, and many families bring even 5 year old kids to this adventurous trip. The rafting is considered leisure rafting, with plenty opportunities to swim, play in the water and take pictures halfway down. Ayung Rafting has 12 kilometres of rafting stream that can be completed between 1 and 2.5 hours, depends on how many people in the raft and how good your guides are. Nevertheless, this is still a great outdoor adventure to try the next time you visit Bali, especially Ubud. Ubud’s famous Monkey Forest is not far from various hotels and resorts, and you can reach the rafting spot in just a couple of minutes depends on where you stay. The signature part of this adventure is you will meet long, stone stairs at the beginning and end of your journey. The stairs are well maintained, but there are about 250 steps per stairs, so it is quite challenging. Nevertheless, your eyes will be pleased with beautiful view around you, including the monkeys and local birds. The rafting activity is complete with guides, safety instructions, equipment, foods and beverages. Along the way, while meeting the 3 and 4 grade rapids, you can also stop halfway down in a quiet spot near waterfall. Here, you can take the opportunity to stand and play under cool waterfall, swim and take pictures. You can also buy some coconut water and other beverages in the food stall at this resting spot before continuing your journey. At the finish line, you will get free buffet style food and opportunities to take some rest and shower. Do not forget to really take your time to get some rest, because you still have to climb a lot of stairs! 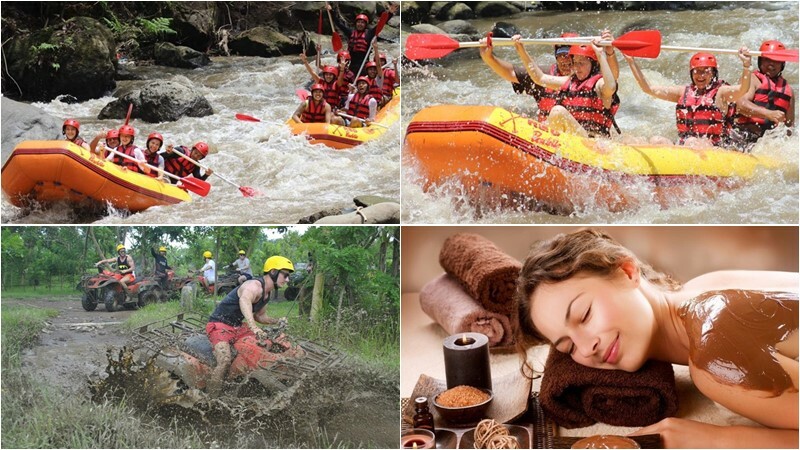 Nevertheless, Ayung Rafting is an outdoor adventure that gets a lot of positive reviews from tourists. You also need to know that there are several different operators who manage rafting on the Ayung river. To make sure that your adventure here ends well, follow these tips. Do not forget to bring waterproof camera and wrap it nicely with plastic bag or in waterproof bag. You also cannot bring your own food and drink, because everything is already available. Also, prepare some cash to buy coconut water and tip your guide. Enjoy outdoor adventure in Monkey Forest by signing up for Ayung Rafting. Or if you have any tour idea to combine Ayung River Rafting with other sightseeing tour and also other adventure activity such as Rafting + ATV ride + Spa, please feel free to contact us to get some tour suggestion from BaliCabDriver staff.